I really enjoy landscape painting and I have learned a few little tricks to create the illusion of a "real" tree. Most of the time, in watercolor, we paint from light to dark. So the first thing I do is look at the lightest values of the foliage I want to depict. With a quick stroke (I call this a brush dance) of my brush, which is held almost straight up and down, I let the tip of the brush dance lightly in several directions around the area that needs the color. After the first application I dry the paper completely. Then I apply the next value in the same manner. Small dabs of transparent, wet paint. I try to pay attention to add this next value only where I see it in my reference photo or the tree I am looking at if I am painting outdoors. I continue on working with value changes, adding additional colors to develop the shadow areas. Notice that the leaves on a tree come from the branches only - not the trunk. Each clump has a shape, and each shape has a light side and a shadow side. The light side will show more of the lighter values, and the shadow side will show more of the darker values. Also, there will be more value contrast (wider range of lights and darks) on a tree that is residing in a very sunny landscape. If the day is overcast, the value range will not be as drastic. After I have painted in most of the foliage, I then, sparingly, add the trunk and branches. I try hard to keep this to a minimum so the tree looks natural. 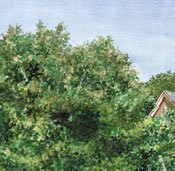 The painting below is a piece I created last year of a cottage in Petoskey, Michigan. Notice the light and dark values in the foliage of the trees. Random strokes and high contrast help to make the illusion of realistic trees. I believe that observation is 90% of creating a piece like this. The other 10% consists of lots of planning and a little painting. 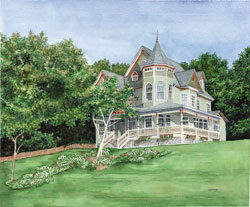 The last image at bottom is a detail of the "Petoskey Cottage" painting. Thank you very much for this. A clear demonstration that is helpful, inspiring and to the point (as well as producing a good effect). I hadn't thought of starting with the foliage!